Shortly before 4 p.m., Jessica Rae Cramer, 27, was driving south on Highway 101 near Santa Margarita when she drove of the highway and into a tree. Cramer’s blood alcohol level was more than twice the legal limit. 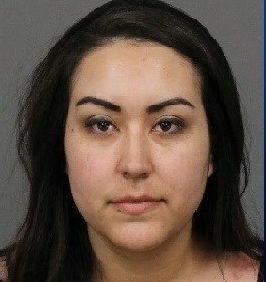 A California Highway Patrol officer arrested Cramer for willful cruelty to a child and DUI and booked her into the San Luis Obispo County Jail. Cramer remains in custody with her bail set at $100,000. Please Ms. Cramer, don’t breed anymore. Thanks. Recreational alcohol is already legal, soon recreational marijuana will be legal too. Will these new tax dollars fund the remove dangerous trees and install more guard rails? Something is wrong with our leadership, remember legalizing gambling to fund our schools, what about prostitution? That could fund our State Capital. $100K is pretty steep bail. Wonder if she had some prior DUI’s. Sympathetic? Her bail is steep because she injured a child. No, just trying to make sense of our court system, which I guess is impossible. Too early for Mother of the Year nominees? Where are her children now? in CPS custody or with relatives? Felony drunk driving and child cruelty. Awful but she’ll be out in no time, plea bargained down to a few misdemeanors, time off for time served in jail, attend some classes, pay a fine, needs to drive to get to work or take children to school, etc. Don’t expect a lot of punishment although it is certainly due her! Sorry I am just very cynical about the new laws and the willingness to settle these things. My heart goes out to her children who are the real victims here. You just told the truth. Welcome to 2017 this is just a preview of coming events with the neutering of laws that are supposed to protect the good citizens. Why do we need care about neutering the laws if the criminals aren’t following them anyway? Oh sorry, I forgot that logic is only supposed to apply to gun control laws. We care about it because it keeps criminals in business knowing that there are no real consequences for their actions. The public cannot have it both ways. If CPS steps in, they are called “baby stealers”. If they do NOT step in, they are negligent. CPS is perpetually short staffed, because the County builds Country Club substations rather than paying their social workers and nurses that serve CPS a non slave wage and standing behind/with their staff. CPS work is heartbreaking and emotionally stressful. Staff must be trained to document everything, assist people like this mother in reunifying with their kids, sometimes almost dragging them to services in the process. These kids will go to their respective “baby daddies” if they are fit and capable. She obviously didn’t have the “Sheriff Fellows” connections, otherwise she would have been cited and released, no booking photo, not taken into custody, allowed to be driven home with a hardy LEO pat on the back.